Jake Holt, a physician and a father of young children, somehow finds the time to grow small seed crops for Southern Exposure in his home garden. Not only that, but he also processes home grown rye into flour for pancakes. 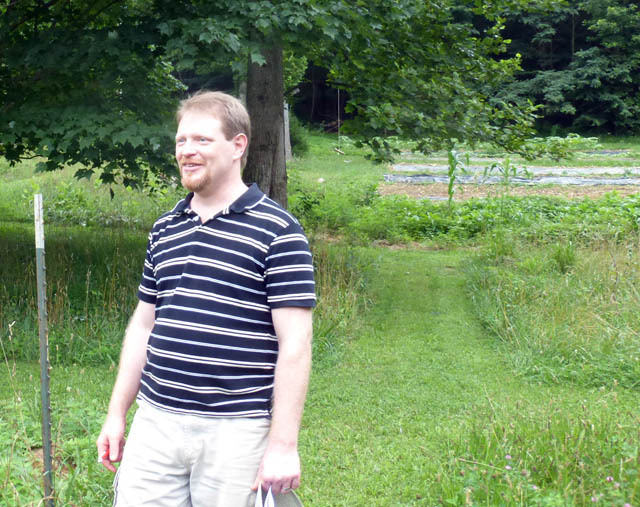 During a visit this summer, Jake showed us one way to thresh rye at home. We pulled seedheads off rye stalks until we had about half a gallon of seedheads in a bucket, enough for a demonstration of the process. 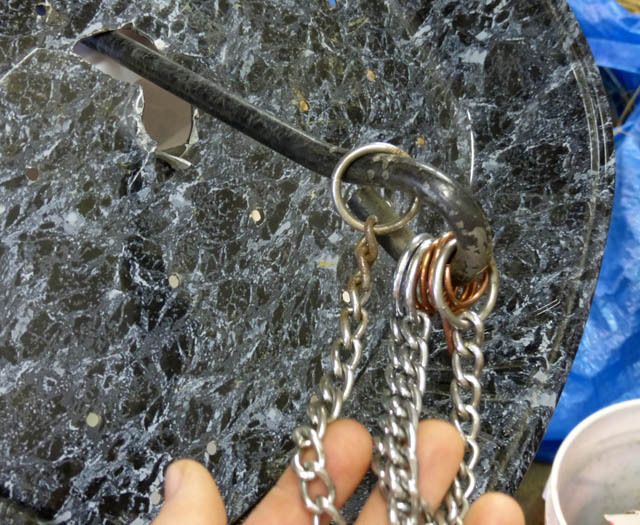 Then Jake brought out a flail made of chains attached to an eye attached to a cordless drill. The contraption also included a shield made from a plastic dish. 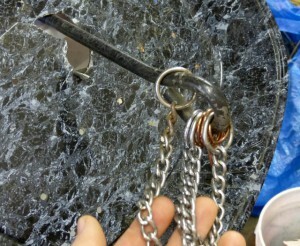 He put the flail in the bucket and ran the drill for several seconds to thresh the grain. 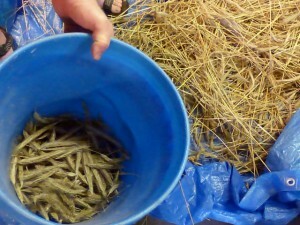 The deseeded husks, still attached to the stem, were easily lifted off, leaving us with a few handfuls of rye seed and light https://www.southernexposure.com/blog/wp-admin/post.php?post=3351&action=editchaff. Jake would then winnow the chaff off by pouring the grain in front of a fan, then grinding it with a hand-crank mill. There is no need for a separate dehuller, as the hulls remain on the stems. You can read more about Jake’s type of thresher in this Mother Earth News blog post. It isn’t very difficult, and his fam ily really loves the pancakes, but this process is long enough that almost none of us will get a significant portion of our calories this way. If your goal is to get a significant portion of your calories from home grown grain, grinding corn is much easier – you can harvest it with a pair of hand pruners, shell it with a hand corn sheller, and hardly winnow it at all. But most of us want wheat products, too. You can grind corn as well as small grains at home in a hand-crank grinder such as a Grain Maker mill. With some grains, you can also find recipes that use whole kernels. 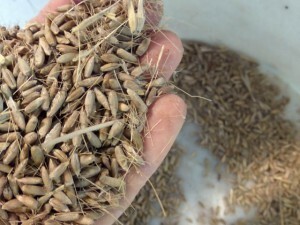 For wheat, rye, oats, and other small grains, I hope there will be a revival of intermediate scales of threshing, winnowing, and milling – larger in scale than Jake Holt’s method, and smaller in scale than modern commercial millers – so that homegrown or locally grown rye flour can once again be used as a staple, rather than just a once-a-week pancake treat. It might be a long shot, but then again, so was the organic movement 30 years ago. 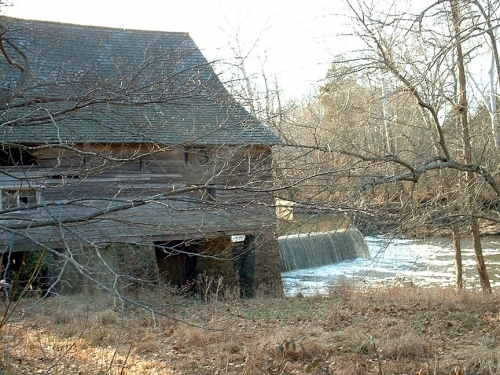 And even as recently as the mid-1980s, a water-powered grain mill in our part of central Virginia was grinding grain from neighboring farms. You might think, “Flour doesn’t cost much at the supermarket. Why grow grain in a moist climate like mine?” Michael Pollan, in his book Cooked, provides us with good reasons. 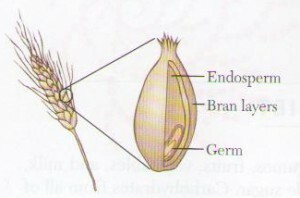 — Once the germ is separated from the rest of the grain, it can deteriorate and become rancid. — Former workers in big commercial mills told Pollan that those mills leave out the germ (and thus most of the identified vitamins) when they reconstitute “whole-wheat” flour. — When modern industrial bakeries make dough, they usually add a lot of ingredients that most of us can’t pronounce. — When we use local grain, we support the local farm economy rather than CEOs and shareholders. 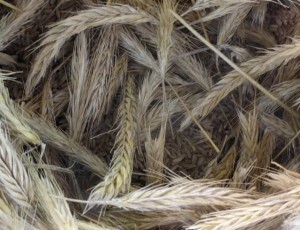 There are still wheats, ryes, and other small grains (in addition to corns) that are adapted to growing in the Southeast. 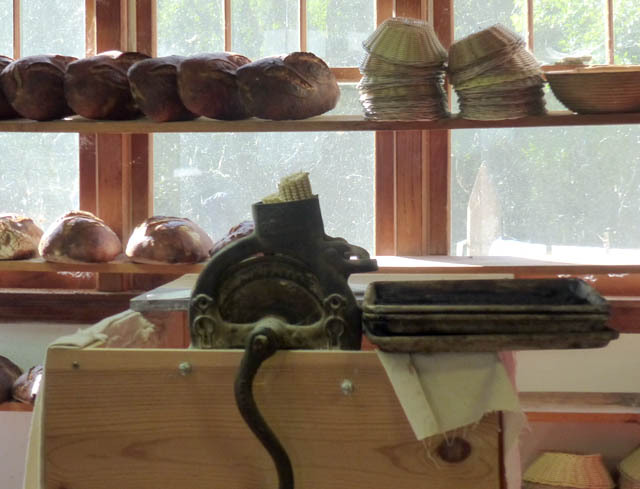 In an upcoming blog post I’ll share our experiences visiting two bakeries that mill their grain, bake with wood heat, and buy from farmers, two of whom I’ll also profile.